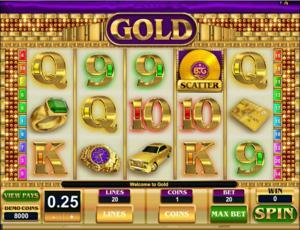 Gold is an online video slot machine game released in January 2013. It is offered exclusively at online casinos powered by Microgaming. This online video slot game has 5 reels and 20 pay lines. The theme of Gold is, naturally, all about gold. Gold is a precious metal that has been very valuable and highly sought-after for making coins, jewelry, and other art types long before the beginning of recorded history. In Gold, you will see a gold-producing factory wherein almost everything is made of gold! Consisting of 20 pay lines and the chance to win up to a whopping 180 Free Spins, you will surely have lots of chances to win in this gold-laden slot game! Microgaming online slot games are available to players in 2 formats – download and no-download. Whether you like to download their software first or you prefer to play instantly without the need to download, then Microgaming surely has online slot machine games to accommodate your every slot gaming preference. Gold is a slot game that belongs to the download category, which means you must download first before you are able to play this particular slot game. Gold is created for those who love gold because they can practically buy anything they want with it. Many players say that they actually enjoyed playing this particular slot game, because it offers lots of things that highly benefits all slots players. The Gold online video slot game features scatter wins, a Wild multiplier symbol, a Free Spin Bonus Feature game wherein you can win up to 180 Free Spins with all Free Spin wins tripled, a maximum coin jackpot of 50,000, and a maximum cash jackpot of $25,000! The quality of the graphics and sound that Microgaming provides is absolutely incredible and top notch. They have an impeccable reputation of making the most eye-catching graphics and superb sound effects that will truly transport you to “that specific theme” they used in any of their slot games. Most people love to play games run by Microgaming software because they have smooth animation and engaging yet non-interfering sounds. In Gold, players are brought to what looks like a golden stage. The symbols are drawn in a realistic manner. All symbols are nicely animated when they are included in winning combinations, and even if this game mostly has golden colors in it, you will definitely not strain your eyes when you play this game for a long time. The overall graphic design of Gold displays mostly the color gold. Other colors used are green, purple, orange, red, blue, black and white. Tranquil jazz music is the constant background music you will hear while playing this slot game. When you spin the reels, faint piano music (with a mechanical winding sound effect) will be heard, and when the Gold Disk scatter symbols appear on the reels, loud drum rolls are played out. Various shimmering sound effects are programmed whenever you form winning combinations. The card deck symbols available in the Gold online video slot game are 9, 10, J, Q, K, and Ace. The regular symbols that you will find in Gold are: the Emerald Ring, Gold Credit Card, Gold Watch, Gold Car, and the Golden 3-Bar. The Wild Symbol is the Gold Briefcase. It is a wild multiplier symbol. Thus, the Gold Briefcase wild symbol not only acts as a substitute for all other symbols (except for the Scatter symbol) in order to you help you form winning combinations, but it also can multiply the payout! The Gold Briefcase wild symbol doubles (multiplier x2) the payout of any winning combination it completes, as long as it acts as a substitute symbol. You are paid varying prize amounts (refer to the Payout table) when you manage to form a winning combination with multiple Gold Briefcase wild symbols on an enabled pay line. Take note that the Gold Briefcase wild symbol winning combination payouts are not doubled. You can win up to 10,000 coins when 5 Wild symbols are involved in a winning combination. The Scatter Symbol is the Gold Disk. Scatter symbols mean that they do not need to appear in a line (on an enabled pay line) for you to win. The Gold Disk scatter symbol can be found scattered anywhere on the 5 reels, and you are able to form winning combinations as long as there are 2 or more Gold Disk scatter symbols that come out. Your winnings are calculated by multiplying the Gold Disk scatter symbol combination payout (refer to the Payout table) by the total number of coins you’ve bet. If you manage to get 3 or more Gold Disk scatter symbols, you will trigger the Free Spin Bonus Feature game. Please take note that if you get a scatter win and a regular win, then you are paid out for both of these wins, because the Gold Disk scatter symbol is not required to come out on an enabled pay line for you to win. The scatter win is included to the pay line win. Free Spin Bonus Feature Game – If you manage to get 3 or more Gold Disk scatter symbols anywhere on the 5 reels, you will activate the Free Spin Bonus Feature game. While playing the Free Spin Bonus Feature game, you can re-trigger the Free Spins by just getting 3 or more Gold Disk scatter symbols (anywhere on the reels), which will award you another set of 15 Free Spins! The additional Free Spins are included to your remaining number of Free Spins. You can win up to a massive 180 Free Spins during the Free Spin Bonus Feature game! Once the Free Spin Bonus Feature game is over, you will be then taken back to the main Gold online slot game, and your winnings from the Free Spin games will be included to your overall balance. Gold has 5 reels where you may bet on 20 pay lines. The minimum bet is 0.01 and the maximum bet is 0.50 per pay line. You can wager 1 up to 5 coins per pay line bet. Therefore, the maximum bet amount is 50.00 per spin. Please take note that the amounts mentioned are in Pounds, but they will remain the same if you choose to play in US dollars, Euros, or Canadian dollars. Also, for every coin that you wager, you will enable another pay line. You will be paid out for winning combinations on enabled pay lines only. The maximum payout in the regular Gold online video slot game is 2,500 coins per line bet. People who regularly play online casino games naturally love to stay longer on online slot games that have an Autoplay function. Good thing that Gold is furnished with this function! In Microgaming online slot games, they have 2 game modes – Regular mode and Expert mode. You can have the game spin automatically for you with the Autoplay function that can be found by clicking the Expert button (if you look closely at the brown line at the bottom part of the game screen, you will see the Expert button just below the Spin button). After customizing the Autoplay function to your preferences, just click on the Start button, and the game will automatically spin for you while you just sit back, relax, and enjoy playing this “gold galore”-themed online video slot game!